Legacy Villas in La Quinta, are located next door to the fabled La Quinta Hotel off of Eisenhower Dr. Architecturally similar to the famous “spa villas” at the La Quinta Hotel, with bleached white walls and Caribbean blue shutters set off with Saltillo tile pavers and inset tiles. This guard gated community offers it’s owners and guests Concierge services at the Hotel, as well as an onsite management company. Old Town La Quinta is approximately 5 minutes away, Hwy 111 is about 15 minutes North on Washington and Interstate 10 is approx. 20 minutes North on Washington St. as well. 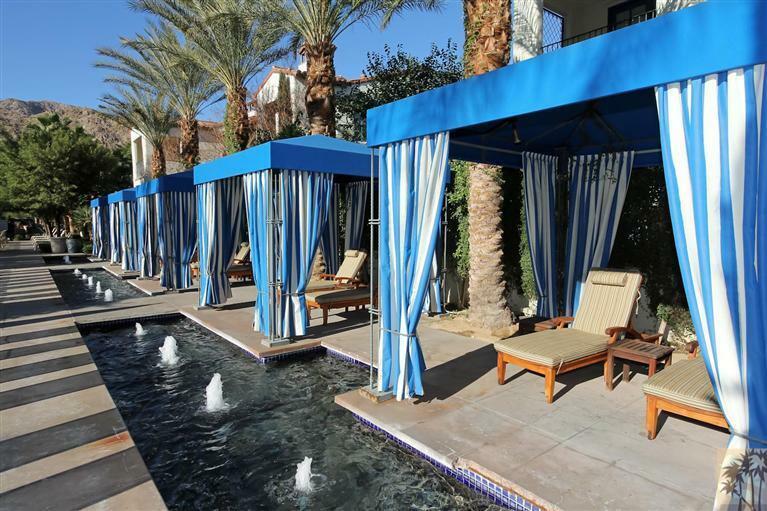 The Legacy Villa’s has a “lock and leave” program, which is especially appealing to Coachella Music Festival, Horseshow & Polo Attendees. Luxury Leasing is popular here! A large, welcoming clubhouse with fitness facilities, a local casual dining room, hammocks stretched between palm trees, walking paths with community pools scattered throughout and startling mountain views so close you feel like you could touch them. The Legacy Villas offer two distinct types of homes for sale. Every home at Legacy is gorgeous, newer construction and extremely well-built. There are free-standing townhomes as well as smaller “pods” of four condos with a common entry courtyard. Each area of Legacy Villas offers winding, lush pathways, Tiered Fountains, porches to appreciate the views and access to community pools and spas. The “Town homes” for an elegant retreat. The Town homes are 3 bd/3 ba and both single and two stories. They range from approx 2200 sf to approx. 3500 sf. Current prices: $300,000 to approx. $700,000. Golf: No course on site, but the Dunes and Mountain courses at the La Quinta Hotel and several other public courses are very nearby. Clubhouse: Private clubhouse with fitness facilities and casual dining. Legacy Villas offer the now famous “Lock and Leave” lifestyle favored by many seasonal owners. There is both an onsite management office to handle the cleaning and leasing of your Condo as well as the additional amenities offered at the La Quinta Hotel and Club just down the street. People that enjoy the community of Legacy Villas also tend to like La Quinta Resort and Club and The Spa Villas and Santa Rosa Cove.